Beloved by critics and readers alike for nearly 60 years, Mary O’Neill’s timeless children’s book of poetry is a tribute to the many beautiful colors we see around us, and is considered a modern children’s classic. 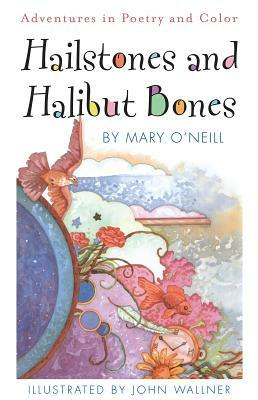 Featuring twelve beautiful poems, and deeply luminous illustrations, Hailstones and Halibut Bones is a perfect poetry addition to any home or classroom library. MARY O'NEILL knew from childhood that she wanted to be a writer. She began her career as an advertising copywriter and after becoming a partner in her own agency, she moved to New York. There she started to write children's books for Doubleday, of which Hailstones and Halibut Bones is the most famous. JOHN WALLNER is the award-winning illustrator of more than thirty books for children. His many awards and honors include several ALA Notables, the Certificate of Excellence from the American Institute of Graphic Excellence(1080), and the American Writers award for best illustrator (1977).